we're happy to forward this event. Please note this is not a Goethe-Zentrum Hyderabad programme. 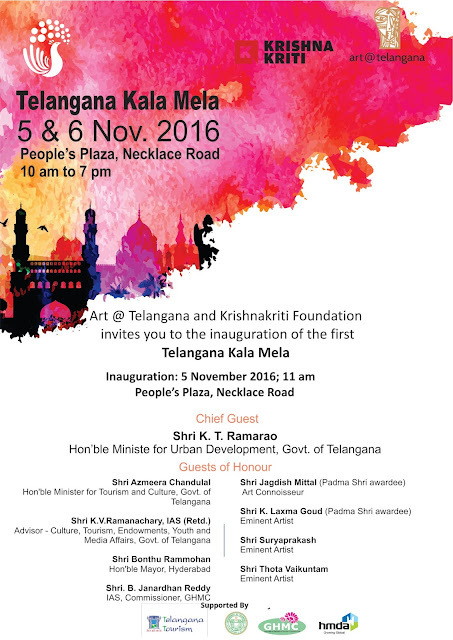 The first Telangana Kala Mela is to be held from 5th to 6th November, 2016 at the People's Plaza, Necklace Road, Hyderabad. The Kala Mela will host more than 200 artists displaying their work and by this aims to provide a conductive platform to the artists living in Telangana. The Festival is happening parallel to the Hyderabad International Street Art Festival, being organized by St+art India Foundation in collaboration with art@telangana and Kalakriti India. It will be one of the major art festivals in the world attracting artists from around the globe to demonstrate their art. It would also be a great opportunity for the artists to sell their work. With an objective to democratize art, Telangana Kala Mela is an open platform for all.